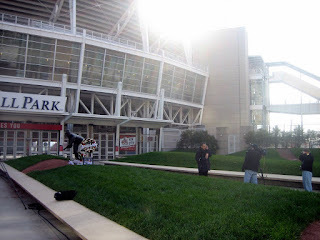 Gerard's Blog: Joe Nuxhall R.I.P. 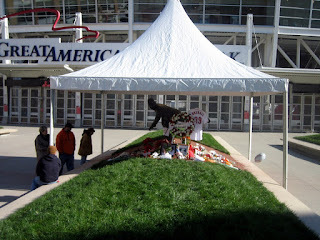 When I heard the news about Joe Nuxhall on Friday morning, I cringed a bit, and felt a wave of sadness pass through me. I went down to the ballpark - not sure why - maybe for no other reason than because it was a clear morning. News crews were already down there doing location spots. On Saturday afternoon, Sarah and I went for a walk and ended up back at the ballpark. 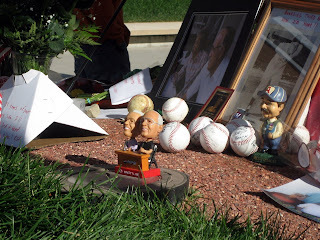 By that time, the memorial had grown. At some point, this guy from 700WLW with a handheld DVR asked me a few questions. You can see more of my salient thoughts on the video here. Rest in peace, ol' lefthander.